In rare circumstances, a worker won’t have write access to any components (for example, when a client worker is bootstrapping itself). In this case, you can send a command from a worker directly instead. The syntax and blueprint nodes for both methods are the same. We don’t recommend doing this in any other situation. 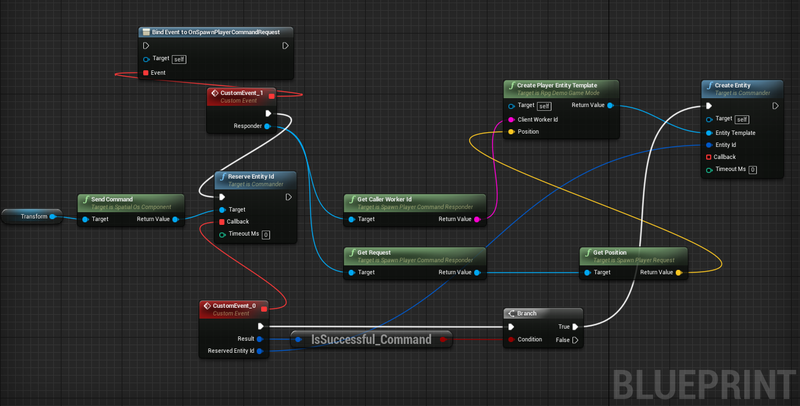 Building up ACLs in blueprints is cumbersome. It might be better to build your ACLs in a C++ Blueprint Function library first, and use those functions in your blueprint graph. Define this method in your header file too. Declare your callback method as a UFunction by using the UFUNCTION() decorator. Sending a command immediately returns a unique request ID for this command request. This request ID can be used to link up and trace the sent request. If the command request failed to send, the method IsValid of the returned request ID will be false. //look up the command request using the RequestId returned from the Result. You can reserve multiple EntityID’s in a single command using ReserveEntityIds. If successful, the callback will return an array of FEntityID’s.